It has been discussed in a fair amount of detail why model based decision-making in conjunction with a logical process for gathering, sorting and assimilating data from necessary sources can produce, when properly employed, a much more efficient means of problem resolution and decision-making. The objective of this particular article is to address and highlight the importance of properly Assigning Values within the Matrix you have constructed. Approaching value designation with a slap dash “whatever” mentality defeats the purpose of using a logical system for decision-making. The objective of Model based decision-making is to eliminate ones emotions, prejudices and subconscious bias from the equation. Thus, assigning logical and carefully considered values to each component of the Matrix is paramount. Other articles have previously discussed what CARVER stands for. Criticality, Accessibility, Recuperability, Vulnerability, Effect and Recognizability. Criticality is, after all, the most important. Remember this can be employed in two ways (primarily). CARVER can be used to access potential targets to strike (or projects to do etc) and it can also be employed in Risk Management or vulnerability assessments to determine what the most high RISK targets are. In previous articles for the purpose of simplicity a very broad brush was used when assigning values within the Matrix. A 1-5 ranking system, one being the lowest, five being the highest is fairly easy to explain and for most readers to comprehend. The reality however, is that a well thought out, carefully constructed value system with different and clearly defined parameters for each component within the matrix increases the likely hood of your Model being efficient and producing accurate and reliable results. Once the scale has been established it is then necessary to define each possible value within that particular Matrix component. This could be done in a fashion as follows. Purpose for Matrix Employment (PME): Risk Assessment and Vulnerability analysis of a facility or installation. 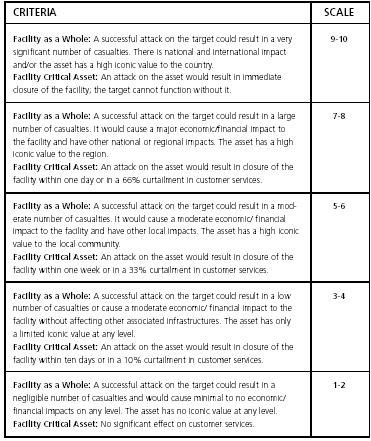 Criticality is determined by four primary factors in a RA/VA CARVER Matrix (Risk assessment/vulnerability analysis). Time– How rapidly will operations/output be affected in correlation with this component being damaged or destroyed. Surrogates– What will be the likely impact on output, quality, production and over-all service. Quality– What percentage of output and service will be curtailed due to target damage. Relativity– How does target A compare relatively to targets B or C? What are their positions? How can the relative value be determined? Two fair examples of detailed criteria and the scale alloted to them can be found below. These are both taken from examples of a RA/VA CARVER Matrix designed by Chris Sneider of the Anaheim police department in conjunction with Telelogic learning Co. 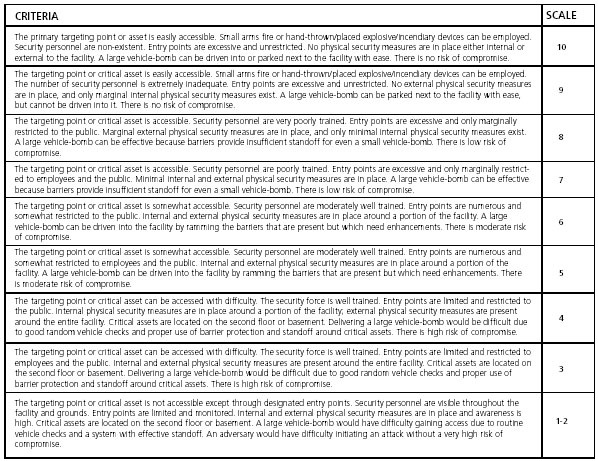 Although these are intended for use in anti-terrorist type of situations, the principles apply across the board to other matrix’s developed under different circumstances as well. The first list of Criteria are for the Criticality Value. The following criteria are meant to be applied to Accessibility. Notice in the Criteria table for Criticality, only five brackets exist. This is because although a 1-10 point system is being employed, Criticality is such a broad component in this situation (but perhaps not in all possible situations; flexibility is important) that five sets of criteria are adequate. Accessibility however requires considerably more detail and hence has additional brackets included in the criteria table. 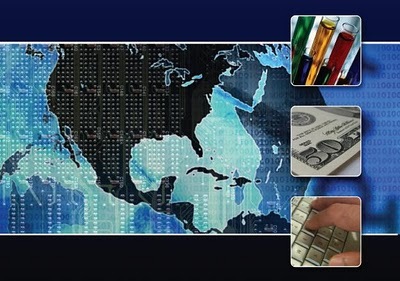 Broad, well-defined values established in accordance with the goal of mission accomplishment, designed and constructed before activation of the Matrix greatly increase the effectiveness of any given Matrix in Model based decision-making.